Caption slip reads: "Photographer: Glickman. Date: 1951-09-17. 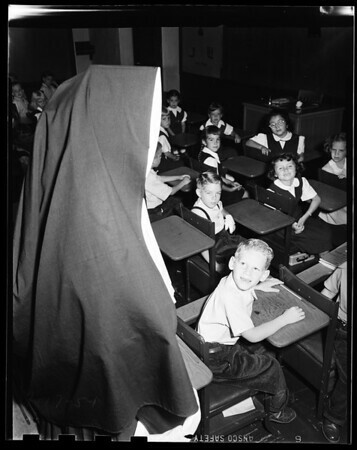 Assignment: Back to School, St. Francis De Sales, Sherman Oaks. 3: sitting among piled school and catching up on his studies even before school begins is John Kuzma age 12 of Sherman Oaks. 4: Welcoming back to school, two students is Father James O'Mahoney (cq). 1/2: Classes in session. 19/20: First day in school for Gregg Goossen, age 6, as he looks up at Madam St. Kenneth, happy kid. 14: trying to iron out first day of school problems is Michael Matara age 6 and Madam St. Kenneth".